How you can show the maximal limit the number of your posts to show in the index or front page WordPress. By default, wordpress shows ten of your posts to appear per page. In fact, you can control it and show any amounts of your posts as you like, you can set it to 10,20,30, etc. 1. I assume you are already logged in to your dashboard admin page. 2. 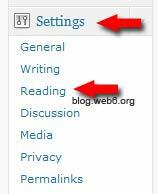 Scroll down and find Settings -> Reading. 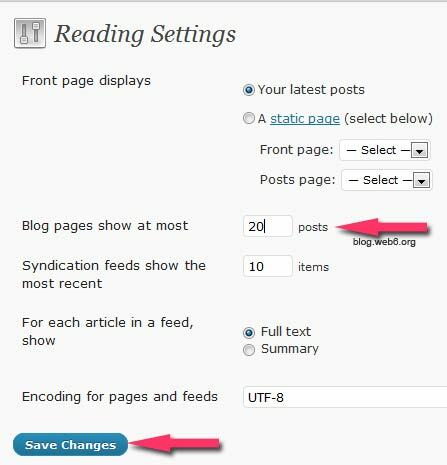 Find more complete about wordpress 3 reading settings here. 3. Once you click that button, this page will show (see image). Type in any numbers you like in the number of posts per page settings box. In this example i want to show “20”. yup we can use as much post in front page… but max 10 post look decent in any theme….. I agree, i also have 10. But some people want to have 1 even, so that it looks like a normal website.